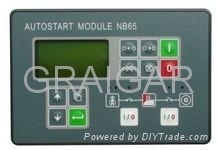 NB65 Automatic Mains Failure Generator Controller. NB65 AMF generator controller is integrated controllers for gen-sets operating in single standby mode. It meets all possible requirements for AMF applications, including modem control, user configuration and full gen-set monitoring and protection. NB65 AMF generator controller is equipped with a powerful graphic display. Icons, symbols and bar graphs for intuitive operation together with high functionality set new standards in gen-set control.